To Europe With Kids: Who Needs a Travel Book? Found this book in my Christmas stocking. 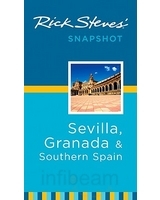 Means hubby's on board with our next destination being the south of Spain. Yaaaahoooo! He wants to see "cool Moorish architecture and stuff." I do too! And flamenco dancers, and the white hill towns, and the massive cathedrals, and the Costa del Sol! But who needs a travel book - the real paper and print object - when there are so many terrific travel blogs out there? (Little plug here for some of my favorites: see sidebar list.) Travel blogs and travel websites undeniably offer more personal, firsthand information. Things like: "the tour guide spoke undecipherable English," or "the hotel lost our reservation" or "their bedsheets don't cover the mattress" or "the bathtub was the point of origin of every bacteria known to man." And, of course, if you're traveling with kids, you want the 411 straight from a mom: are there changing tables there? can we get fries with that? will my teenager think omg mom, it's so boring? Some well chosen narrative travel writing is definitely essential. When traveling as a young backpacker, Let's Go: Europe was my travel bible. Revised every year, written by students, its straight-forward, witty coverage and reviews kept me within my budget and directed me to every hot spot. But since we've acquired a bit more money and a bit more, ahem, maturity, I go for more sagacious reading, such as Frommer's or Rick Steves'. Particularly effectual when traveling with children, are the Self-Guided Walks in Rick Steves' books. Tell your child (of a reading age) that it's a scavenger hunt or a treasure map, and hand him or her the book. Simple, detailed instructions such as: "Start in front of the cathedral. Walk with the cathedral on your right until you reach a garden. Don't enter the garden now, but instead cross the square, head through the tiled arch, and admire the statue of Julius Caesar," means your CHILD can lead YOU around the city, accomplishing both seeing the sites and keeping him or her occupied, if not enthralled. You gotta love it. And I ask, can you do this with a Kindle? I finally found my way to your blog through blog-frog. I've been concentrating on my cat's blog and his online newspaper, The Anipal Times (he's the Editor-in-Chief), and am only now giving full attention to my bohokids.com site. www. I have too many www's .com! Last month, while in NYC, I threw my guide book in the trash at the corner of Central Park West and 72nd street. Allison, armed with only her iPhone, was able to download a Subway application, street maps, restaurant guides, (including menus, pricing and online reservations), directions to ANYWHERE, top sites to see...everything! And, even my 2010 guidebook had out of business restaurants and stores listed. I took several photos of her taking ONE minute to check her 3 ounce, pocket-sized phone and get us exactly where we were going! Thanks so much for including me in your list. South of Spain?!? That sounds like so much fun. I can't wait to follow you on that adventure! My oldest loves to follow maps of all kinds: museum maps, subway maps, street maps! Although I constantly check travel blogs before we go on a trip, we will never give up the guidebook just because of that! Thanks for stopping by! I've been to bohokids several times - fun site! You're absolutely right - hubby's iPhone was big competition for street maps and subway maps on our last trip! And it is portable, too. I just can never get it out of his hands to get him to actually look at the sites! Thanks so much for the mention, Sonja! I'll be coming back to read about your travels! Thanks for the mention, Sonja! Have to agree with you about the niceness of a guidebook, but I'm wondering if I'm slowly heading into the minority with the number of Kindle/Nook/iPads sold this past Christmas. I have to admit, I've thought how nice it would be to put all my books onto one (relatively) lightweight spot. Hmmm. . . it'll be interesting to see where things go. Happy New Year! Hi Sonja! Great blog. Let me know if you want any advice when you come to visit Spain. Take care! Thanks for the mention Sonja! I am in Venice right now with the fam so your timing is perfect! Thanks for the mention Sonja(Highlandmummy). Noticed your article in Copenhagen- we were there last summer! Fabulous and the National Gallery museum, which includes a children museum and hours of entertainment is FREE!